42% of consumers make the internet their first stop for healthcare information, ranking the web second to actual physicians. Following this trend, healthcare marketers have increased their investment in a variety of digital advertising channels such as native, video, mobile, content and more in order to better educate and inspire healthcare consumers. But whatever digital channels healthcare marketers choose, the environment matters. Consumers make snap judgments about brands based on adjacency. 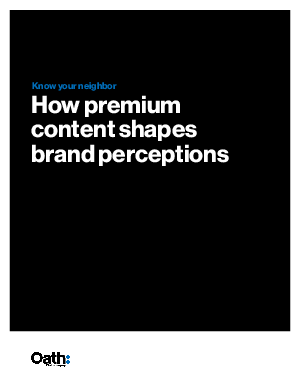 Over two-thirds of your audience will feel less favorably towards a brand if its placed next to untrustworthy, offensive, or low-quality content. Fortunately for brands the flip side is also true, which is why it’s imperative that you guarantee ad placements that share digital space with premium content. With Oath’s reputation as a trusted publisher, healthcare brands can experience peace of mind knowing their consumers will make positive associations that will increase brand loyalty.